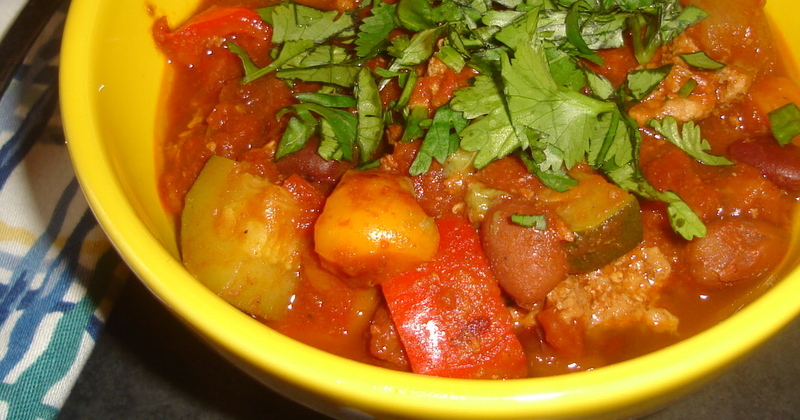 Turkey vegetable chili: One bowl fits all. Feeding my household is challenging at best. I am the only mammal eater, so there’s no upside to making beef or pork. In fact it’s come to the point where I have to take my steak or burger into another room to spare my loved ones the traumatizing smell of charred, formerly sentient flesh. Salt and cheese are off the menu owing to Mr. Slattern’s health concerns, the apple of my eye dislikes potatoes, I’m trying to avoid pasta and bread, and serving beans more than once a week would be, gastrically speaking, unfortunate on an Old Testament scale. Let’s just leave it at that. So it’s fish or chicken or turkey or fish most nights, except on omelette night, or in the event of a sit down strike, which in my house is shorthand for I’m sick of cooking, out of ideas and borrowing patience, so unless you’re prepared to have cereal (and in my case, vodka) for dinner — yes, again — we’d best go out. Still and all, there are days when dinner must be got on the table despite a real lack of enthusiasm, and it is at these times when I go to the old standby, the one-bowl meal. There’s no coordinating of multiple components and the meal arrives at the table hot and satisfying with only minor clean-up required. One of the dishes we can all cope with is turkey chili. I throw in extra vegetables, so there’s no expectation that a salad is coming anyone’s way, and I have found that anything served with guacamole gets a warm reception. As an added bonus, this recipe makes enough for two family meals (or one if Aunt Bertha joins us, but she’s in Boca for “the season” so that’s not an issue at the moment) with leftovers for a lunch or two. I make no claims that this will win any chili cook-off or that it is “authentic” south of the border fare; rather, it’s tasty, fresh and nutritious, and I have never had a complaint. Cover the bottom of a large pot with olive oil. Heat over medium high heat/flame. From good ingredients comes good food. Stir everything around and let it cook for a minute or so, then add 1 lb ground turkey and break it into chunks with your wooden spoon as it cooks. If you prefer, ground chicken, beef or pork will also work, or you can skip the meat altogether and add an extra can of beans in the next step. Cook, stirring occasionally, until the meat is cooked through (or about five minutes for meatless chili). Stir it all around and bring it back up to a boil, then reduce the heat and simmer for about a half hour. And that’s it! I have found that this tastes better on the second day, but that’s no news where soups are concerned. As such I usually make this in the morning, then leave it sitting on the counter until dinner time. To serve, just add a dollop of guacamole or sour cream, or both. You can sprinkle it with a little grated cheddar and serve some rice or corn bread on the side. Or not. Done! 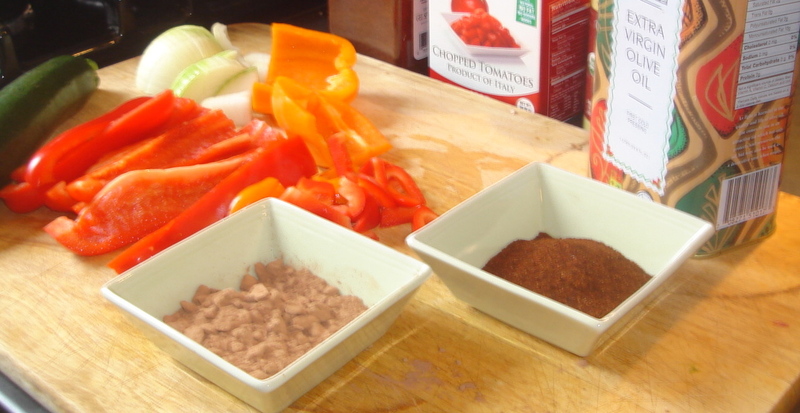 Posted on February 8, 2012, in Dinner, One bowl meals, The easy way and tagged Bean, Bell pepper, Chicken, Chili pepper, Chili powder, Cook, Drink and Food, Easy, Humor/Commentary, Old Testament, Olive oil, Turkey. Bookmark the permalink. 6 Comments. Great recipe and awesome title! I will need ONE GINORMOUS bowl… more like a TROUGH full of this delicious stew! It really makes all the difference. Thanks for visiting. Love your work!